Paris Saint-Germain central midfielder Marco Verratti bamboozled Finland’s midfield today with some superb dribbling, check out this exciting piece of skill from the Italian. In the 66th minute of the match Verratti received the ball in Finland’s half and no one could have expected that Verratti was about to pull off a sublime piece of skill. The 26-year-old effortlessly dragged the ball back and turned his man before playing a pass. 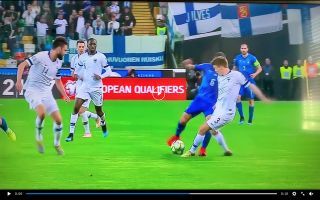 Finland’s midfielder had no absolutely no idea what was happening, who can blame him – Verratti’s dazzling footwork looked like something straight off of Fifa Street. This isn’t a side that we get to see from Verratti very often, the Italian is usually heralded for his playmaking abilities.